The USA as it is. The U.S.A. has completely lost its way as a nation. Rhetoric and money control our social conscious and our domestic and foreign policy. This has led us into a place where we are a very pathetic example of a democratic nation. We are, in my opinion, not really a democracy but an invisible aristocracy. We are a nation ruled by moneyed interests, most of whom are unknown to the U.S. public in general. 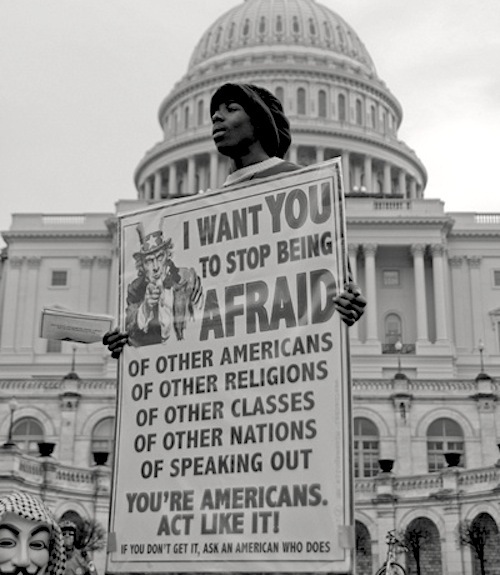 Tabling questions surrounding the legitimacy of our entire nation that was built on and is sustained by the threat of force, and avoiding a deeper discussion of how things got the way, I want to just cut to what I think we can do to help our nation as it is. I think if we want to reaffirm our desire to be a model pluralistic democracy we need to make a number of changes to reorient our nation in that direction. The following suggestions are things I think just about every U.S. citizens could get behind if we stopped, set down the party loyalties, turned off the talking heads on T.V., and thought about what was truly best for our nation and the world. For the most part these are in no specific order, except for the last three which I believe are the most fundamental and important. How different is this from the slavery block really? Currently the U.S.A. incarcerates it citizens at a rate five times higher than any other industrialized nation. We have 5% of the world’s population and 25% of the world’s jail population. This system is inherently racist. Ethnic minorities and those from poor neighborhoods are far more likely to end up trapped in our jail economy than whites and those from richer neighborhoods. They face higher conviction rates and tougher sentences for no real reason other than systemic racial bias in our society. Keeping people in jail or on probation destroys families and only perpetuates the cycle of poverty, crime, and jail-time. As such, the justice/prison system in the U.S. functions as a form of legally sanctioned Jim Crow laws and socially approved lynching. While I believe various laws can be reformed and changed I believe the primary thing we need to do is to move from a punitive justice model to a restorative community based model. In the punitive model, the thought is criminals should be punished for their crime and this punishment will act as a warning to other criminals who are considering doing harm. This does not work out to well. The recidivism rate (the rate of people who commit a crime, go free and then go on to commit more crime) is incredibly high. Something like 75%+. Punitive justice does not work, and the experience of jail is not a deterrent. Either people are simply too evil to care, they are committing crimes for reasons that punishment does not change, or they are being incarcerated in our dubious legal system for a variety of reasons. Restorative community based justice focuses on involving the community, reforming the individual and ultimately restoring the individual to society, not as an ex-con but as a rehabilitated peer. Our justice system did start out with this aim. Jails in the U.S. were originally places where people would reflect upon and be penitent about their crimes before returning to their society. That is why some jails are still called penitentiaries. We lost this focus a long time ago and settled for an industrialized and de-personalized jail system. While efficient, it is broken. While reform and restoration might not be possible with every criminal, such as true sociopaths or serial killers, I believe the majority of people, especially youths, in the criminal justice system could be restored to their communities and we would have less crime, less tax burdens and a healthier society as a whole. The next generation that should be driving the economy will just be driving the profits of banks. I think we should work towards subsidizing education beyond high school. This would mean the government footing the bill for U.S. citizens pursuing education at colleges, career, technical or trade schools. Many countries, such as Canada, subsidize secondary education. This leads to a better educated, more debt free and capable work force. For-profit education and student loans are killing my generation and many are not buying homes, starting families, and making purchases (aka, driving the economy) because of these issues which is only adding to economic stagnation. While this system is being implemented I believe we should also help those who have student loan debt by freezing interests, buying and cancelling debt (like the OWS movement is doing) and otherwise attempting to tone down the for profit education industry and loan industry. I think we should pursue a dual healthcare system, similar to Australia’s healthcare system. What this means is that I believe the U.S. should provide healthcare for all of its citizens through taxes. I also believe private healthcare should be allowed to continue to exists. This would provide a baseline safety net for all of our citizens but not exclude companies using private health care insurance as an added incentive for attracting top candidates nor would it prevent individuals with the means to do so to buy their preferred healthcare. Such a system would alleviate a lot of stress and worry many citizens feel over their health and it is also a cheaper way to handle health care for the nation. Some might say that the government is bad at providing healthcare and therefore it should not be done. They cry, “Just look at the VA system! Clearly the U.S. cannot be trusted to run hospitals.”Ron Paul uses this argument. Where is our can-do American optimism? Are we suggesting that other countries can pull this off but we cannot? Are we suggesting because something is wrong or broken it can never be fixed? This is just rhetoric. If the U.S. has a bad track record of providing health insurance for our veterans the solution is not to make sure that the U.S. government never gets involved in healthcare, but making sure the right heads roll, the right heads replace them, and the right solutions are implemented. Call me an idealist but I think we are up to the challenge. I realize there is no perfect healthcare system, but I think this would be the best one, and a similar system is already in place in other countries. Our economy and society is capitalistic in nature. That means it is fundamentally based on buying and consuming things we do not need. This represents a culture of waste and exploitation with nothing more than a token respect for the land that we are dependent upon. This is why half of all the food in the U.S. is wasted and we burn through resources more than any other country in the world. As the Western way of life is exported around the world and more countries adopt our practices and our waste, this situation is becoming increasingly dire. This type of economy and society is sending us not just towards a financial cliff but an environmental cliff. Because we cannot bail ourselves out of a famine or eat money, the sensible thing to do is to move towards a sustainable economy and learn to live within our means. This means investing in green/renewable energy. Now is the time to invest and rapidly develop these types of energy. We should not wait until the oil runs out or there are no more mountains to level. This means reorganizing our society and the way things are done. Everything from family size to how we get our food is impacted by our use of energy. This means being willing to rethink the assumption that the only way for the U.S.A. to exist is to be devoted to free-market capitalism. Can these people do something beneficial for a change? There are a number of legislative and electoral reforms I believe we should make happen yesterday. We should eliminate the electoral college system. The vote of every U.S. citizen should count equally when deciding the next federal leader. We should end the ability for politicians to add unrelated amendments/additions to bills. This slows down the process of bill approval, enables pork-barrel spending, and muddies the issues on otherwise clear reforms that could and should take place. We should also make corporate lobbying and Super-PAC’s illegal. This is a form of legalized bribery. When the person with the most money to buy up ad time wins, and the vast majority of money comes from individual donors or Super-PACs, we are allowing a select few to essentially chose our president and elected officials while we pretend we are in control. Incumbent politicians, concerned with re-election, have to raise $20,000 a day to get re-elected. They have to devote their time to fundraising and not to reading legislation and interacting with the people they were supposedly elected to represent. When this is a reality, democracy does not exist. Lobbying, Super-PACs, and other way money gets into politics is the basic mechanism that has enabled our democracy to morph into a sham democracy that is truly an invisible aristocracy. We should put a stop to this. While market competition and entrepreneurial endeavors in our economy we need to develop sensible legislation to deal with mega-corporations. I am not talking about dealing with the local family owned grocer, I am talking about the mega-corporations that own our politicians. As clearly stated by this article international corporations have become a power unto themselves. When Coca Cola can hire paramilitaries to kill unionists in South America to keep costs down in their bottling plants, with impunity, I think we can all agree corporations have become too powerful and their primary incentive of profits will inevitably result in injustice and misery. This is not a new situation. In his recent book Overthrow: America’s Century of Regime Change from Hawaii to Iraq, the author Stephen Kinzer writes about how our nation building has followed a very predictable pattern over the last hundred years. This pattern has always been driven by American business interests in foreign countries. When the profits of U.S. companies operating overseas are threatened the ball is kicked to politicians and ultimately sold to the public, with the rationale for invasion and occupation being morphed at each level. The U.S. is guided by the business interests of mega corporations, not by reason, ideals, or the will of the people. Again, in this situation, a true democracy cannot exist. One example of sensible reform would be to deal with our tax policy regarding corporations. As a recent documentary has presented, the taxation policy governing large corporations is influenced by the income defense industry, an industry of lawyers and bureaucrats that are in the employ of large corporations to protect the corporation from taxes. It is the exploitation of our tax system and our legislative policy that has allowed for companies, like GM, to pay no taxes to the government. We should probably close these loopholes, and take measure to prevent this from happening. Another example of sensible reform would be to audit our subsidies. The government currently subsidies a number of large industries, often to the detriment of the U.S. public as a whole, that do not need it. The result of Depression era subsidies not being removed? $20 billion of government subsidies ends up in the richest farmers of America. Roughly half the revenue of the cotton industry are subsidies. U.S. subsidies are hurting other economies and by buying up our excess the U.S.G is contributing to global poverty. 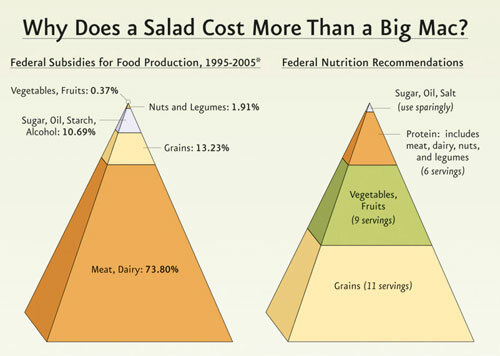 Healthier food costs far more than unhealthy food. We need to rethink and reform these subsidies that are undercutting our free-market, hurting public health, contributing to global poverty and feeding mega-corporations. The U.S.A. is a military empire. Some might disagree with this and suggest that we do not invade other countries to take their land, so we are not an empire. Let me respond to this objection to make my point clear. First, we stole these lands from Native Americans through violence or buying the land from people who had done it for us. Second, we have military bases in a variety of countries. What foreign country has military bases on U.S. soil? Third, we use the threat of the projection of our force and our gigantic military to get our way in the world. This sounds a lot like a military empire to me. Just because we currently are not taking new land, or use intermediaries like paramilitary groups, private military companies and terrorists, does not mean we are not using violence to get our way. We have, like all empires, become too accustomed to this and it will ultimately destroy us or the world. Unless we change, this destruction will most likely occur due to a global conflict over the dwindling resources of this planet. It will probably be fighting with either Russia or China over what remains of the resources in Africa. Before WWII the U.S. had pursued a policy of essentially conscription when military arms and personal were needed. After WWII, for a variety of reasons, a standing military and arms industry were pursued. This changed the political, economic, (and according to Eisenhower) spiritual landscape of America. In his speech, 51 years ago, Eisenhower predicted what was going to go wrong with the U.S.A over the next several decades. Since WWII the U.S. has increasingly become reliant upon our “Defense” industry. The use of military force, or the explicit or implicit threat of force, has been used to get what we want on the global stage. Additionally, at home we have become increasingly reliant upon it to create jobs and move money from the government to the private sector. The military, the arms industry and associated industries, such as private military companies and support contractors, are in a very lucrative business. This over-reliance is perhaps most acutely evidenced by the unprovoked invasion of Iraq. In Desert Storm we came to the rescue of Kuwait and fought Iraq with a U.N. mandate, saying it was not okay to just invade another country. Several years later we unilaterally invaded Iraq without the approval of the U.N. or any serious provocation or cause from Iraq. We just invaded because we could and we knew no one could stop us. We have become drunk on our power and mixed with WWII nostalgia we still think of ourselves as the world’s perpetually justified policeman. This status quo has made cutting our ridiculous defense budget impractical and unpopular. Opponents of this sensible option suggest to cut our defense spending would mean cutting jobs, rethinking foreign policy, appearing “weak” to our enemies, and adjusting many facets of our social and global behavior. I would agree, but I think this would be a good thing. This is the most important change I think we need to make. The United States is a country without a strong storied common culture that reaches back centuries around which we can unite and galvanize our citizens. We are a country of immigrants that has primarily been run along Western European values. Some historians have argued that land and opportunity have taken the place of a common shared history as the center of our culture. In place of a shared history, our orientation towards the Future, Manifest Destiny, the Frontier and the American Dream has united U.S. citizens and pushed our culture forward. As a result we are a present and future oriented country. This makes sense as we have little shared history to focus on even if we wanted to. While this is good for our nation in some ways, it also cripples us. We routinely repeat our own mistakes and are short-sighted when it comes to just about everything. If we took a sober and critical look at our history, even over the last fifty years, we would see that many of our problems have been faced before by this nation and many of our present solutions will most likely just pass the buck onto the next generation. A prime example of this is in our foreign policy. We routinely create the enemies future generations of U.S. citizens have to fight. In Overthrow, Kinzer highlights how our dirty dealings in Cuba directly led to the rise of Communism in Cuba, which ultimately led to the Cuban missile crisis and the near destruction of the world in nuclear Armageddon. Again this whole situation was sparked by an impulse to protect American financial and business interests in Cuba. Another more recent example would be Osama Bin Laden and others. We supported and used Osama Bin Laden and many others as a proxy to fight the Soviet Union and advance American interests abroad. While perhaps sensible at the time, this led to highly problematic unintended consequences. We have helped create so many monsters that we have lost control of, one would think that we would make better decisions…but our focus on immediacy, on sound-bites, on the present cripples us from seeing the clear patterns we need to clue into. This entry was posted in Personal Commentary, Politics and tagged aristocracy, capitalism, consumerism, Democracy, dual health care, financial reform, free health care, history, legislative reform, mega-corporations, Osama bin Laden, Overthrow, politics, prison economy, prison reform, regime change, socialized health care, subsidies, sustainability, U.S.A.. Bookmark the permalink.